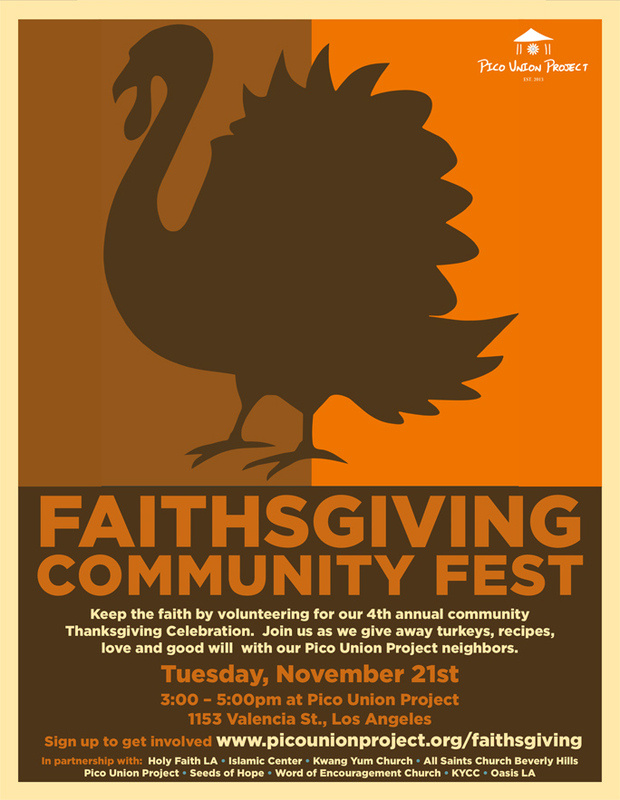 On Tuesday, November 21, 2017, the fourth annual Faithsgiving will be held from 3:00-5:00 P.M. at the Pico Union Project, during which some 300 turkeys will be distributed to underserved families during a festive neighborhood celebration that will include music, food, art projects, and more. “Faithsgiving is a great opportunity to open our doors to our neighbors and make sure they can fully participate in America’s nationwide day of thanks.” Reverend Nat Katz, All Saints Beverly Hills. The turkeys are being donated from a variety of sources and will be distributed to local residents who would not otherwise be able to afford them. “The Pico Union Project is a daily laboratory for the Golden Rule – to love our neighbors as wish to be loved,” said Micah Edward Acton, Program Intern at The Pico Union Project. “Faithsgiving is a great opportunity to open our doors to our neighbors and make sure they can fully participate in America’s nationwide day of thanks.” said Reverend Nat Katz, All Saints Beverly Hills. Pico Union Project is located at 1153 Valencia Street in Los Angeles, and is a multi-faith, multicultural center housed in the 1909 original home of Sinai Temple. 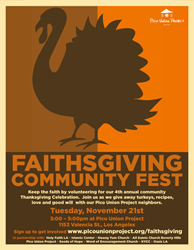 Faithsgiving is just one of a wide range of PUP’s community activities that include farmers markets, concerts and arts programs. It is also home to Word of Encouragement Church and Kwang Yum Community Church, and brings 300 people together every year from across Los Angeles for Jewish High Holy Days services. For more information, contact The Pico Union Project at 818-760-1077.